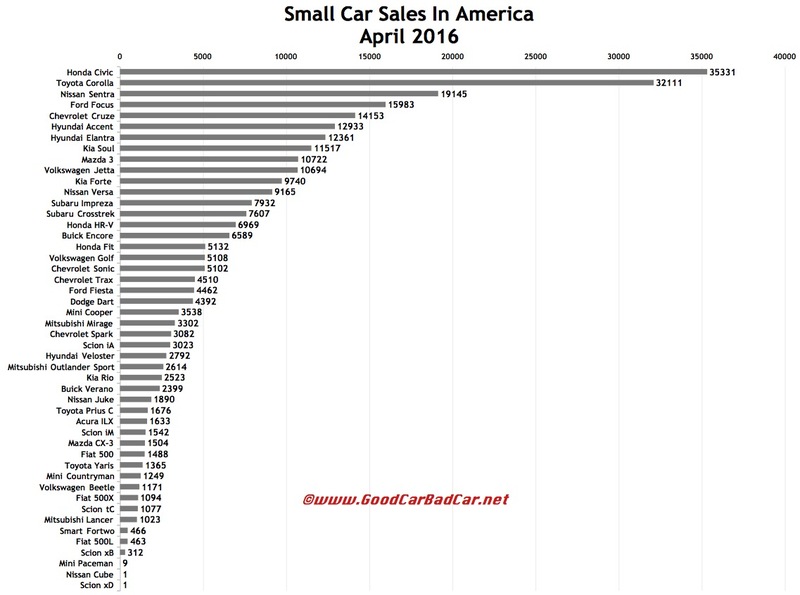 America’s three top-selling compact cars produced 47% of April 2016’s compact car sales volume, as the Honda Civic, Toyota Corolla, and Nissan Sentra all sold more often in April 2016 than in April 2015. In the case of the Civic and Sentra, the gains of these two recently revamped/refreshed were significant last month. The Civic, America’s top-selling car overall in April 2016, jumped 25% to 35,331 units, a 23-month high. Nissan’s Sentra, which averaged approximately 15,000 monthly sales in calendar year 2014, is averaging more than 20,000 monthly sales in 2016 so far. Yet while Civic, Corolla, and Sentra sales increased in April along with rivals from Kia and Mazda, the losses posted by the transitioning Chevrolet Cruze and Hyundai Elantra, increasingly unpopular Dodge Dart, and struggling Volkswagens brought the compact car category down. Both in April and on year-to-date terms, U.S. sales of compact cars are down 5%. 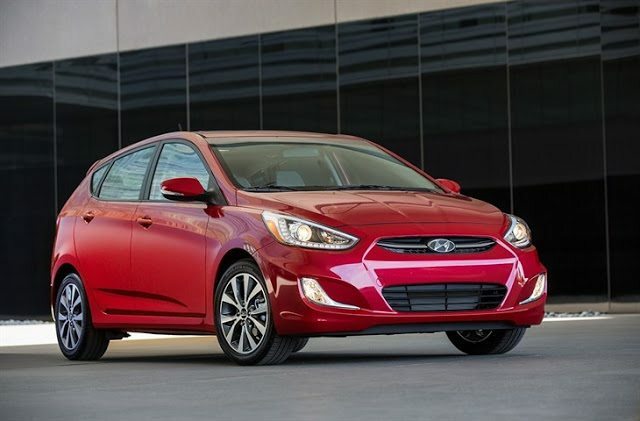 In the midst of the Elantra’s sharp decline, Hyundai increased Accent availability and volume. 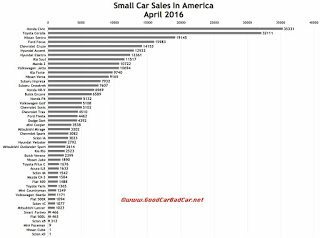 The Accent was the lone subcompact to post increased sales in April 2016. Hyunda, which typically sells 5200 Accents per month, sold 12,933 Accents in April. You can click any model name in the tables below to find historical monthly and yearly U.S. auto sales data. You can also select a make and model at GCBC’s Sales Stats page. These tables are sortable, so you can rank small cars of all kinds any which way you like. Suggestions on how GCBC should break down segments can be passed on through the Contact page. GCBC isn’t here to break down segments, an impossible task for any group, but to display sales data for the sake of comparison. The more ways sales data can be displayed, the better. This explains why you’ll see the Encore and XV Crosstrek are listed with small SUVs, too, and the Acura ILX shown with mainstream cars is also displayed with luxury cars… because readers have wanted it both ways. You can always find the sales results for EVERY vehicle and form your own competitive sets by using the All Vehicle Rankings posts.